Information submitted in a nomination letter to the U.S. National Ski Hall of Fame by Carl T. Olin, Jr. It was refreshing to find a person with such a modest attitude and yet one dedicated to jumping perfection, who was always striving to win. Gene Wilson’s conduct was as exemplary off the “hill” as it was on. Leading a simple and wholesome life, he was conscious of physical fitness. His character and demeanor were exceptional. In short, Americans envisage such a person as their symbol of a successful athlete. Born October 1, 1913 in Remer, Minnesota, Eugene Wilson lived in Coleraine, Minnesota since age 10. He was educated at Greenway High School in Coleraine. Before retiring in 1975, Gene was employed for 35 years by U.S. Steel in the Iron Ore Analysis Laboratory in Coleraine as a technician. He was married to the former Valborg (Wally) Martinson of Coleraine, Minnesota. Although blind since childhood, Wally was a homemaker and she and Gene raised two fine children: Larry and Sharon. Wally was known in the area for her piano playing talent and she performed as a member of a local dance band. On occasion, Gene would contribute his fine, tenor voice to a community function with Wally in accompaniment. It was a flu epidemic that really gave momentum to Gene’s budding skiing career at the age of ten. The schools were closed and that gave him time to discover that ski jumping was for him. Olaf Mangseth of Coleraine, official of the U.S. Ski Association and 1967 selection to the National Ski Hall of Fame was quick to recognize the talent of this young athlete. Under Olaf’s guidance, Gene developed the drive to improve his performance and style which remained with him throughout his jumping participation. He finished in the top three places in 69 of 80 major jump meets according to National Ski Association statistics at the end of the 1947 season. This is the remarkable record of Eugene (Gene) A. Wilson whose skisport career spanned three decades, from 1933 to 1963. To add significance to this accomplishment, his list of competitor read like a who’s who of outstanding jumpers to any contemporary. These skisport athletes included Rudd, Engen, Tokle, Devlin, Fredheim, Kotlarek, Unland, Perrault, Bietila, Barber and Zoberski as well as may others. Gene was a strong contributor to the new, apparent, effortless ride in which he seemed to virtually float through the air. This was the forerunner to ski flying. It is the special recognition which the achiever receives that makes his amateur participation especially rewarding.. Gene certainly received some of these to highlight his career. He also contributed to the skisport by his membership activity in ski jumping organizations. The competitive record achieved by Gene Wilson is a tribute to his contribution to the skisport. By his performances, he exhibited national competitive championship stature. His continued top total score ranking in so many contests over such a period of time is truly outstanding. 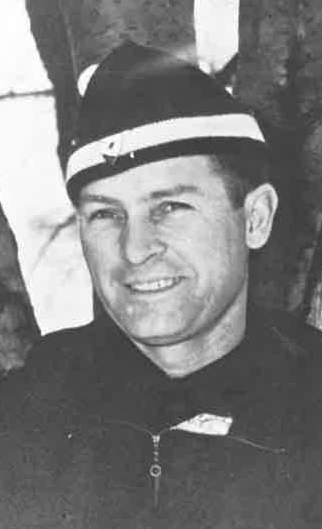 Eugene Wilson was elected to the U.S. National Ski Hall of Fame in 1982. If you notice any errors or inconsistencies in Eugene Wilson's bio, click here to let us know.